Niger Delta Militants Declare Operation Black September For Chevron Facilities. 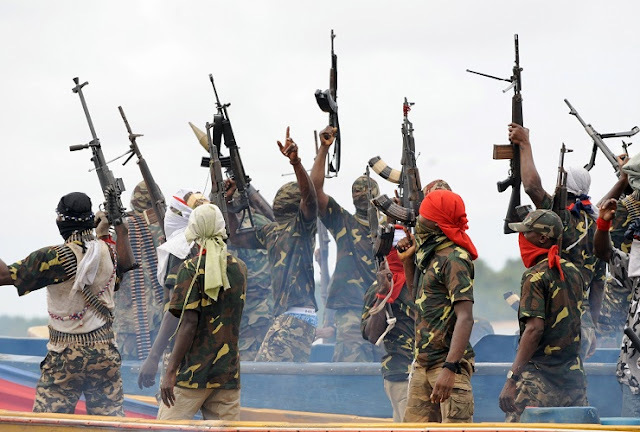 Niger Delta militants under the aegis of Niger Delta Musketeers has issued 21 days ultimatum to Chevron Nigeria Limited to re-classify all VTP5/OTP2 and VTP6 trainees, just as they declared “Operation Black September” for all Chevron Facilities in the Niger Delta and 21 Days for the Federal Government to implement all PANDEF’s 16-Point Agenda and all IOCs to vacate the region. In a statement signed on behalf of the group by the Spokesman of Niger Delta Musketeers, Jenekpo Okpookpo stated that when they told the leadership of PANDEF and other critical stakeholders in the Niger Delta when they intervened at the peak of hostilities in the region that the hegemonic operators and cabals of the Nigerian Government should not be trusted that all they wanted and will continue to do was their manipulative propensity to continue to take charge of the proceeds of their oil and gas resources, use same to massage their ego to the detriment of their interest, nobody listened. The militants noted in the statement that after several months of the intervention and the seizure of hostilities, what do they get in return to show for the increase in price of crude oil and the quantity of barrel of crude oil produced and exported per day. It added that “most surprisingly is that all those who intervened then remains aloof, all promises made then were just lip services and the situation gets worse on daily basis, even the directives for all IOCs to be relocated to their appropriate environment in the Niger Delta was honoured. They assured that the “Operation Black September” is intended to ground all Chevron Nigeria Limited operations in all locations in the Niger Delta like the Okan, Meji, Meta, Meren, Abiteye, Opuekeba, Sonam, Agbami FPSO, Chevron Tank Farm, and EGTL gas plant will be grounded to consume other elements of oppressive and exploitative tendencies in the region. “We are totally fed up with the Antics of the Buhari led Federal Government who seems to have abandoned the PANDEF 16-point agenda and the plights of the Niger Deltans. “We are appalled that issues like the setting up of Modular refineries have since been replaced by the Federal Government with a refinery project in Katsina. The Ogoni Land Clean up, Ogidigben Gas City Project, and relocation of all IOCs headquarters have all been abandoned. “The recent recruitment of over 300 persons by the Nigeria Ports Authority (NPA) without any Niger Deltan employed is another proof that Niger Deltans are being treated as second class citizens in this country. “It is this continuous desire to enslave Niger Deltans that have emboldened Chevron Nigeria Limited to continue to treat qualified and well trained sons and daughters of the Niger Delta as slave labourers despite the fact that the VTP5/OTP2 finished their On-The-Job Learning since 2015, and other trainees in this type of training in other Chevron Strategic Business units like the Aboriginal Training in Australia and Canada, Regional Occupation Training program in USA, and Settapat Training program in Thailand that started same time with our brothers in these locations have long been enjoying their pay as Chevron Staff. “We wish to call on all relevant Embassies especially those of the USA, Britain, France, Germany and others to as a matter of urgency withdraw their personnel from all IOCs operating in the Niger Delta before the expiration of this ultimatum. “Let it be known that “Operation Black September” will be the mother of all operations in the Niger Delta”, the statement warned.